Machines must be able to communicate with other machines and business software and run autonomously with very little intervention by operators. This May the woodworking world will be meeting, once again, at LIGNA in Germany. The best and the newest in machinery will be showcased. As in the previous shows in Atlanta and Hanover Germany, Industry 4.0 will be a major theme. 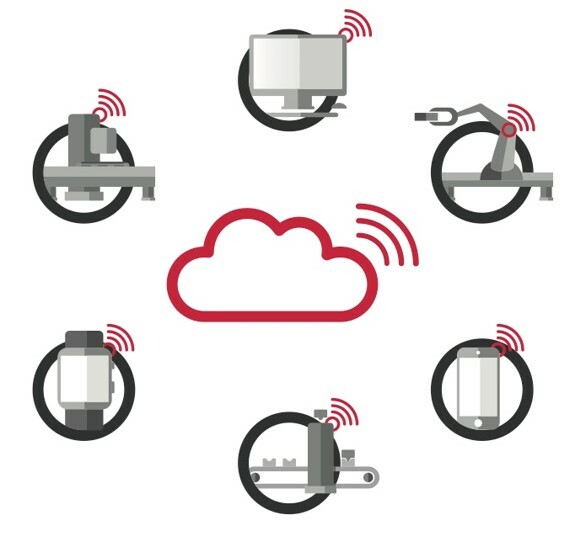 The subject of Industry 4.0, the Connected Factory, or the Smart Factory is the focus of new development within the manufacturing industry worldwide. The woodworking and furniture industry are also transforming - because they must. We see how the internet is transforming our life, at home and at work. It changes the way we conduct business. It is inevitable that our industry will transition. The only question is if the change is an evolution, and somewhat controlled, or will it be a revolution and disruptive? How much of a game changer will it be? 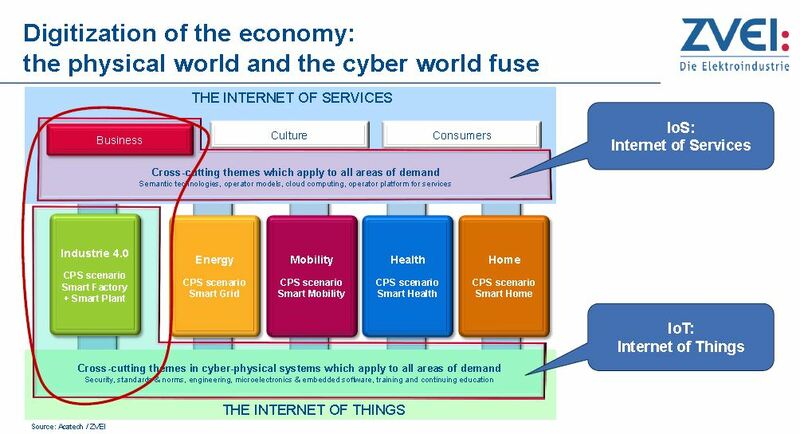 The Internet of Services (IoS) and the Internet of Things (IoT) will not go around our industry - it will go right through it! 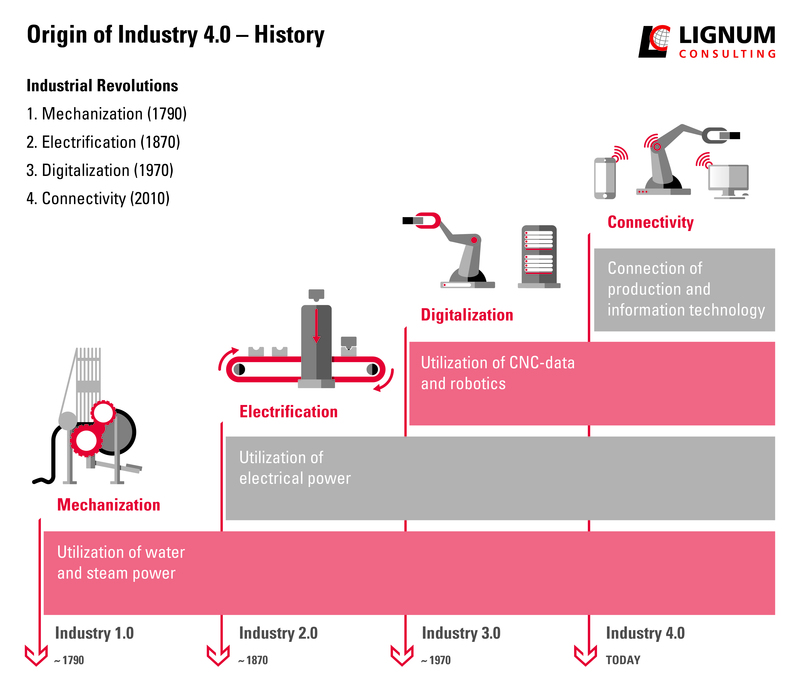 Industry 4.0 or The Connected Factory will transform the woodworking and furniture industry in the same way it will change all other manufacturing sectors. Internet-based sales are growing extremely fast. Key players in the industry are taking delivery times down from weeks to days. The supply chain/logistics companies are working on concepts to deliver furniture at the same speed as phones, clothes, and other consumer goods. The Smart Factory is not just for big companies. There are good examples where relatively small companies have successfully adopted the technology. In most of these cases there is a tech-savvy owner/operator to push the envelope. Companies, big or small, need to start addressing their own Industry 4.0 future. 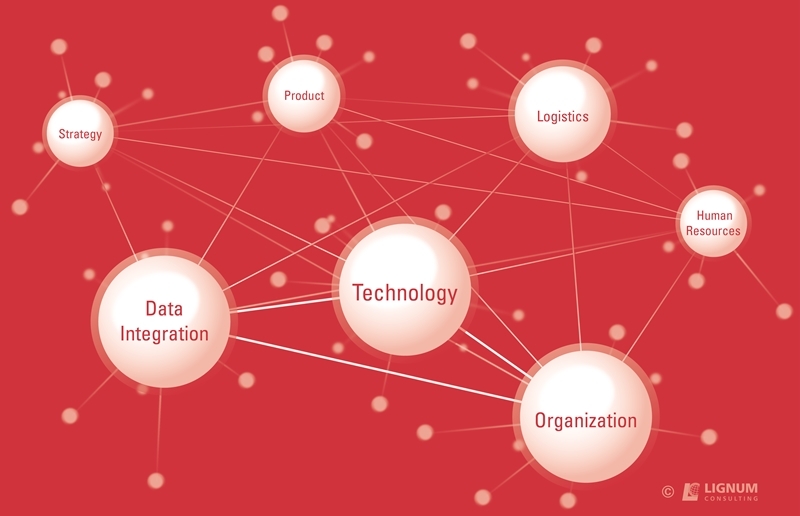 By analyzing these seven subjects, you create a snapshot of where the company is now. Gaps will show, and future capital investments and major organizational and internal projects can be evaluated on the impact they make on the score card. In the previous articles we focused on “Strategy” and “Product”. This article will do a deep-dive into “Technology”. Process Engineering – Defining the right automated technology and equipment for the business. Analyzing the current manufacturing processes and understanding the leading-edge technology used in our and similar industries is a critical element in the Technology category. The equipment and software need to be aligned with the size, product mix and manufacturing model of the company. The manufacturing processes also need to be in line with the product and volume requirements. For example, in cabinet manufacturing, is nesting or cut and drill the best process? Does the company’s situation justify feed-through equipment or is stationary equipment sufficiently effective and productive? Are smart production cells or integrated production lines the right approach? In edgebanding, which gluing system (i.e. PUR vs. EVA) is most suitable for the current and near future of the company? Process engineering and equipment specifications need to support the manufacturing model (we will write more about this in a later segment). With the escalation of the Connected Factory, Process Engineering becomes increasingly important and more complex. Before Industry 4.0, technology needed to be flexible, cost-effective, and fast. Machines were island solutions. Machines were linked to form machine groups, but essentially, they were still island solutions. Now, with the next step forward, machines need to be “all of the above” and must be able to communicate with other machines and business software and run autonomously with very little intervention by operators. Only this way can companies respond to the increasing shortage of qualified labor and meet their strategic growth targets. You do not have to invest in the highest degree of integrated and automated equipment all the time. The technology applied needs to match the business requirements. Economic rules still apply in the world of Industry 4.0. As you push automation, it must remain economically viable. Your investment strategy however must have a strong focus on the networking ability of the equipment. The more leading-edge technology you apply, the more you might have to accept a longer payback period. Therefore, it is also very important to have a strategy in place to grow into automation. One of the many challenges for the industry is the lack of universal standards and communication protocols between the different machine suppliers. Not every machine can communicate with other machines or software. The compatibility and ability to integrate must be key in the selection process. In your overall investment strategy, you create the ideal scenario. Incremental investments will have to fit this future plan, even if you do not have the means to interconnect them currently. But successfully implementing highly automated and integrated equipment is more than purchasing a piece of equipment. The company’s support structure must be ramped up as well in order to fully utilize the potential of the equipment. The engineering staff needs to be trained in automated processes and equipment. More and more, engineering will be driving the efficiencies of the processes and the installed equipment. They need to understand not only the equipment, but also the other inputs that make the automation successful. With an increased level of technology, the reliance level of the equipment needs to increase as well. We can not rely on Corrective Maintenance - a system where “we repair it when it breaks down." Even a system of Preventative Maintenance needs to be upgraded to Predictive Maintenance. Defined processes need to be in place to minimize and/or prevent unplanned equipment stoppages and breakdowns. Industry 4.0 supports maintenance efforts with vision systems whereby maintenance operators can communicate with technical support staff from the machine suppliers (seeing the same thing). In the future, machines will recognize the need for a component exchange, order the machine component, and indicate the need for the replacement autonomously. Leading edge technology also includes leading edge tooling. Industry 4.0 will also have a major impact on tools. Tracking tools and their usage easily provides data to optimise their use and provides feedback for improvements. The collected data will be used to enhance the specification, sharpening cycles, operating data – the entire life cycle of tools is being digitized. With the amount of data provided by sensors in the machine, tool suppliers can be integrated in the management of tools. There are already some developments, where instead of selling tools to the manufacturer, tool suppliers will provide tools on a charge-per-use basis. Dust collection, compressed air, heating/cooling, IT network, and building management are all part of the company’s infrastructure. Dust collection is connected to all the machines electronically that produce dust and chips. The data from the machines (i.e. on/off, chip producing = tools engaged) is communicated to the dust collector, which then regulates the appropriate exhaust volume (CFM) by controlling the RPM of the exhaust motors. The disposal system is connected via text or email to inform the truck driver of a full disposal bin. Big data is collected for analysis to further reduce the energy consumption of the system and optimize the maintenance. The cost of compressed air is traditionally ignored. Compressors are running full-time, and airlines are leaking. Energy reviews on compressed air systems show that the energy consumption cost, as part of the total cost of compressed air over the lifetime of a compressor (i.e. 10 years) is a multiple of the initial investment cost. Sensors and gauges can again provide data for analysis and control of the equipment. The additional information provided by this Industry 4.0 technology will lead to better equipment utilization and operating cost reduction. The best comparison here is the advances we see in our homes. We can control temperature and lights with our smartphones. If it is beneficial in relatively small residential homes, consider how much more will this improve the operation costs in industrial buildings. The factory of the future is fully networked. Equipment, sensors and workers need to have access to, and share, information. It is rather clear that Industry 4.0 cannot be purchased with deep pockets and a few purchase orders alone. There is also no one-size-fits-all roadmap for woodworking companies. The reality is that the details are important, and details can be defined only if you have a team that understands the subject. Reading up on the subject and visiting tradeshows are excellent starting points. One fact becomes clear, the Smart Factory of the future requires cooperation of team members within manufacturing, operations, product engineering and IT competencies. We will continue to write about Industry 4.0 and the seven key areas of Industry 4.0. The next article will focus on Logistics in the Connected Factory. We welcome and encourage your feedback, and you can reach us at Info@lignum-consulting.com. Georg Frey is the president of Lignum Consulting. Sepp Gmeiner is a partner at Lignum Consulting. They can be reached at info@lignum-consulting.com.